I'm not really sure why music videos are even made these days. MTV hardly plays them, and if they do, it's rarely in their entirety. I understand why big name artists can do it, because their labels will pay for it, but I'm often surprised to see indie artists doing it. Seems like a waste of money. They do make nice promotional pieces, though. Well, people like Kanye West can make videos. And they can probably have their choice of directors. Michel Gondry is one of the best and one of my favorites. He uses a lot of camera tricks and stop-motion photography. 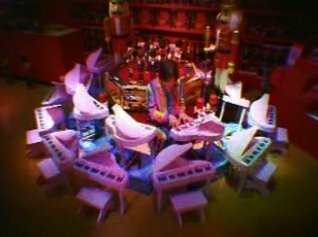 He did the White Stripes video for "The Hardest Button to Button" (the one with all the drums moving around). He also directed Eternal Sunshine of the Spotless Mind. The look and feel of the video is not only warm and, well, nice, but it's also very Christmas-y. That's strange to me, because I associate this song with when I first heard the album in August. In my head, it's a fun summer song, so it's interesting to see it infused with the feel of Christmastime. *Kanye, being from Chicago, should know better than to use Macy's, what with them buying up Marshall Field's and changing the name.